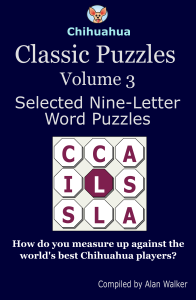 Each book contains 100 classic puzzles from the Chihuahua Word Puzzle website, with statistics and charts you can use to measure your success against online players from around the world. 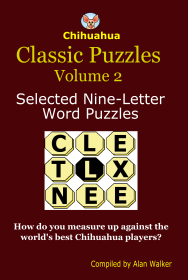 See how many words of at least four letters you can make from an array of nine letters. 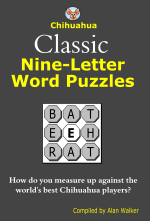 The letter in the middle must be used in every word, and at least one word can be made that uses all the letters. All solutions are given at the back of the book. Sample chart from a Chihuahua Classic book. How do you measure up against the world's best Chihuahua players?